Na Pali Coast views from the 1/4 mile marker of the Kalalau Trail. Kauai is a nature lover’s paradise. Travelers to Kauai will spend very little if any time indoors during the day and instead will be exploring the great outdoors. Kauai’s outdoor activities include snorkeling, fishing, golfing, kayaking, swimming, hiking and more. We love hiking in Hawaii, and Kauai has two epic Na Pali Coast hikes for active travelers to enjoy. Views of Ke'e Beach from the Kalalau Trail. Kauai’s Kalalau Trail is arguably the most famous hike in all of the Hawaiian Islands and is the only land access to the Na Pali Coast. 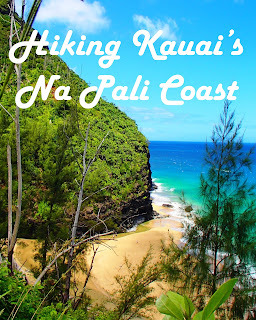 The full Kalalau Trail spans 11 miles along the Na Pali Coast and requires permits and overnight camping. But day hikers can still experience the magnificence of this Na Pali Coast hike by hiking the first two miles of the Kalalau Trail to Hanakapi'ai Beach, which does not require a camping permit. While perhaps the best views of the Na Pali Coast are achieved by air or sea, the views along the first section of the Kalalau Trail are quite spectacular, and you get that added thrill from hiking a trail that was created in the late 1800s to connect Hawaiians living in these remote valleys to the rest of Kauai. The Ke’e Beach to Hanakapi'ai Beach portion of the Kalalau Trail is two miles of fluctuating uphill and downhill trekking, though the first half is mostly uphill and the second half is mostly downhill, which is good news for the return. At the end of two miles is Hanakapi'ai Beach, which is a great place to sit, take a break, and eat a snack. But don’t plan on going in the water. The water is dangerous with unseen currents. At last count 82 people have been killed in the currents. There’s a warning board near the beach which keeps a running tally of fatalities. The second portion of the hike is not for the faint of heart. If you’re hiking for the Na Pali Coast views, the two-mile portion of the Kalalau Trail might be enough. It’s strenuous, but not too strenuous. However, if you’re really looking for an adventurous hike, you can take a left turn at Hanakapi'ai Beach and start heading inland on the 1.8 mile trail to Hanakapi'ai Falls. But beware, this trail is muddy. I’m not talking about patches of mud. 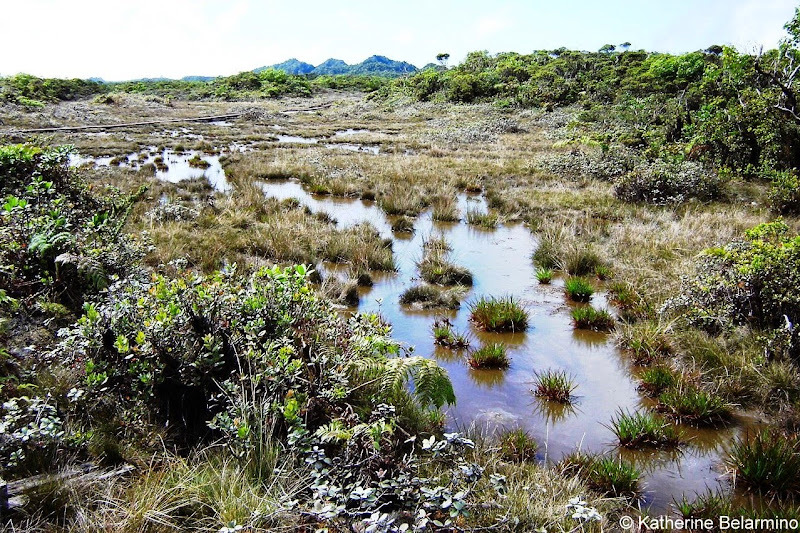 I’m talking about slogging through deep puddles of water and squishy, gushy, slurpy mud. Just in case you didn't believe me about the mud. The first mile isn't too bad, though it starts getting pretty muddy about a half-mile in. The second half of the trail to the waterfall is more difficult as it crosses the river four times before reaching the falls. If you have good balance, you can hop across the rocks. Do not attempt this in bad weather or if the river is too rough or high. If you are more on the clumsy side (like me) forget about hopping the rocks and just schlep through the water. You will be happier. Trust me. The reward at the end is an Olympic size pool at the base of the 300-foot high Hanakapi'ai Falls. The water is super cold, but it feels good after hiking four miles uphill, downhill, through mud, and through water. If hiking the Kalalau Trail, arrive early, preferably before 8:30 a.m., as the parking areas fill quickly. The trail head is at Ke'e Beach (which is a great place for snorkeling in the summer). If hiking the full eight miles round-trip, plan to set aside six to eight hours for the hike. Bring plenty of water and snacks. You may want to bring water shoes to cross the river, but it takes so long to keep switching out your shoes you’ll probably end up walking through the water in your hiking shoes. They’re going to get caked in mud anyways. The beginning of the Pihea Trail. 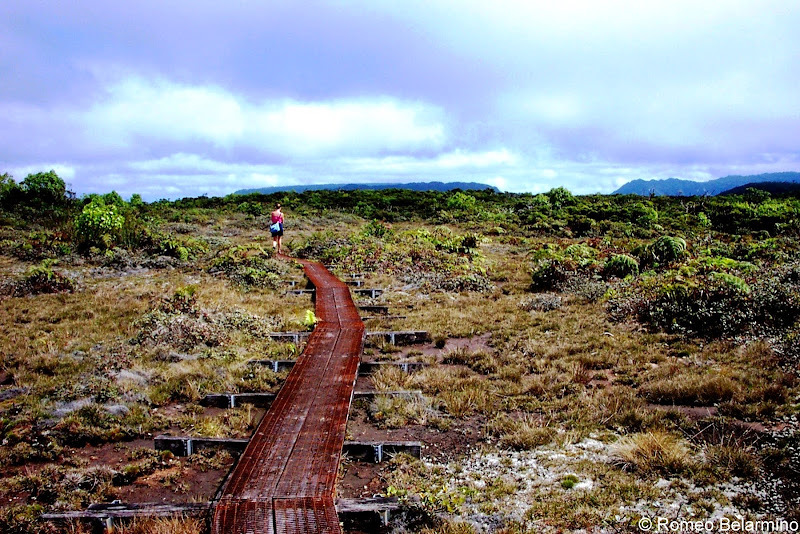 The Pihea Trail to Alaka'i Swamp isn't technically a Na Pali Coast hike, but it spans the mountain ridges above the Na Pali Coast and provides some beautiful almost aerial views of the Na Pali Coast. It is also eight miles round-trip. 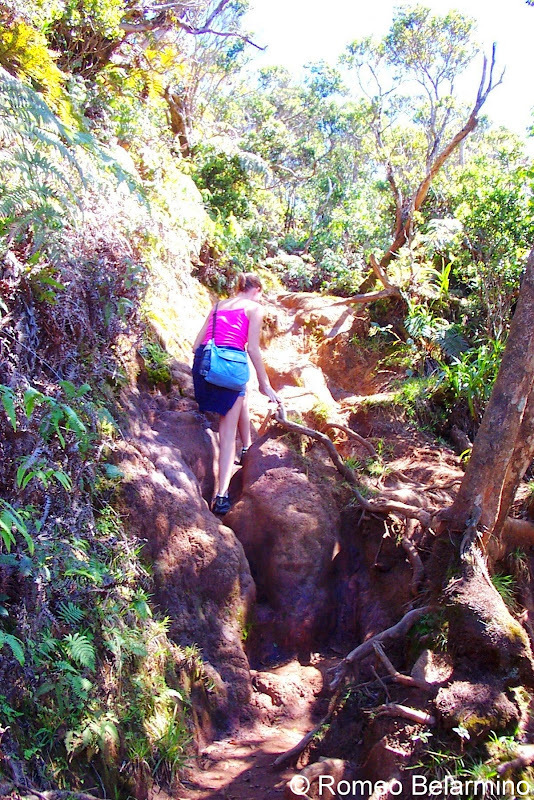 While the Kalalau Trail follows the Na Pali Coast and culminates at the base of the Kalalau Valley, the Pihea Trail follows the back rim of Kalalau Valley before connecting with the Alaka'i Swamp trail. We did this hike when we visited Kauai nine years ago, and it is an accomplishment I have been quite proud of since. View of Kalalau Valley from the Pihea Trail. While the Kalalau Trail starts at the northwest extreme end of the road that doesn't quite wrap around the island of Kauai, the Pihea trail starts near the end of the southwest end of the road past the Waimea Canyon lookout. The trail head is at the Pu’u o Kila Lookout, which is one of the wettest spots on earth, getting over 500 inches of rain a year. There are some very steep climbs on the Pihea Trail. After traversing the mountain ridge of the Kalalau Valley, the Pihea Trail then heads inland until it meets with the Alaka’i Swamp Trail, which leads through the highest elevation swamp in the world. The trail continues along elevated walkways closer to the coast and culminates at the Kilohana Lookout, which provides breathtaking views of the coast, quite near but above Hanakapi'ai Falls. 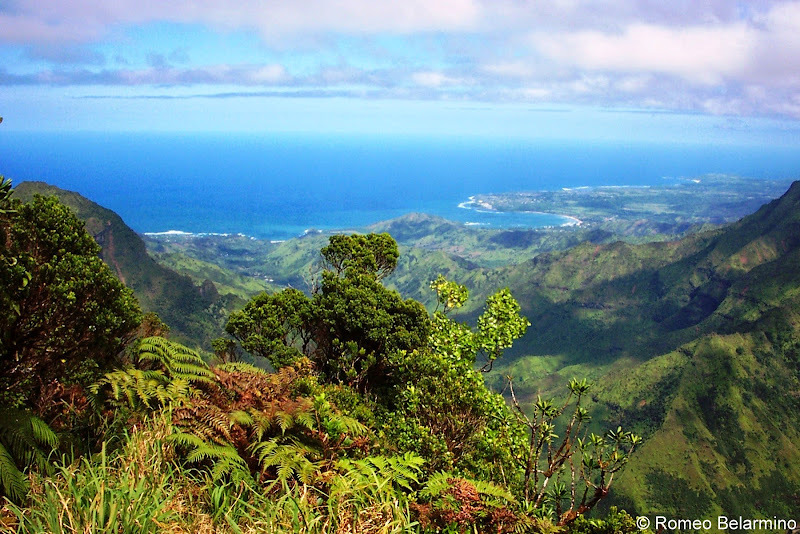 On a clear day you can see all the way to Hanalei Bay and Princeville. Crossing the Alaka'i Swamp on elevated walkways. As with the Kalalau Trail to Hanakapi'ai Falls hike, start early in the morning, bring lots of water and snacks, and plan to spend at least six hours hiking. Views of Hanalei Bay from the Kilohana Lookout. If you ask the locals for advice on a really good hike in Kauai, they will quite likely suggest either the Kalalau Trail to Hanakapi'ai Falls or the Pihea Trail to Alaka'i Swamp. And if you tell them you've hiked one or both of them, they are sure to be impressed, because these hikes aren't your everyday hikes. 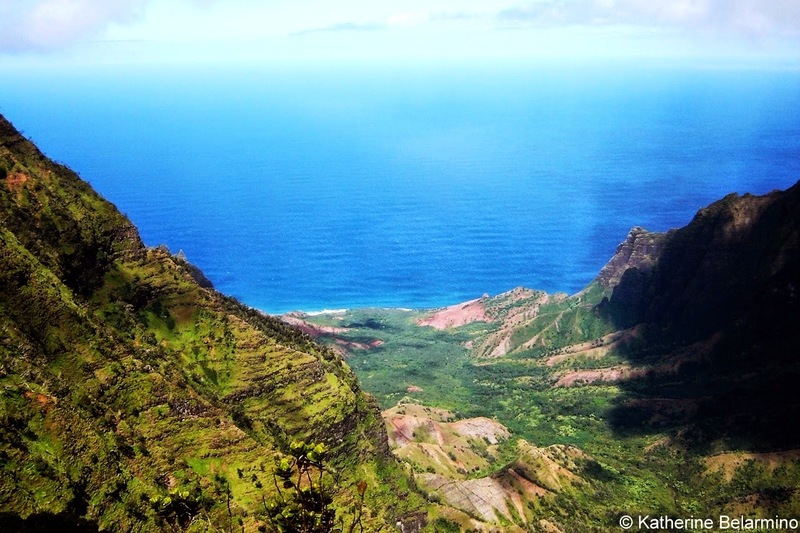 These Na Pali Coast hikes aren't the easiest, but they are epic hikes with extraordinary views.